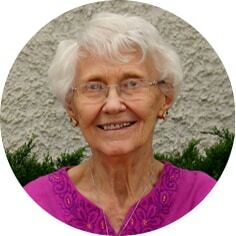 Elma Edna Rudeen (née: Schultz) passed away peacefully in her sleep in the early hours of Tuesday, April 9th, 2019. Elma was born on the family farm north of Mazenod, SK on August 27th, 1927 to Gottfried and Regina Schultz. Elma was baptized and confirmed at St. John’s Lutheran Church north of Mazenod. She attended Cathyrne School and Mazenod School. Elma was predeceased by her parents, her sisters Elsie Arsenault, Emelia Kot, Pauline Young, Frieda Dreger, and her only brother Alfred. Elma is survived by her husband, Alan; daughters: Gwen (Don) Peterson, Sharon (Tony) Oberding, and Rhonda (Gary) Lang; sons, Duane (Rashimah) Rudeen and Dennis Rudeen; grandchildren: Therese Oberding, David (Erin) Oberding, Melissa (Zack Beale) Oberding, Cheri Oberding, Steven Lang, Braeden (Courtney) Lang, Syafiqah Rudeen, Liyana Rudeen and Imran Rudeen; great-grandchildren: Erin Oberding, Cale Oberding, Ava Oberding, Logan Dougherty, Annabelle Beale, and Madeline Beale; sisters, Irene (Jake) Bartole and Martha Giroux; and many nieces and nephews. A Memorial Service will be held on Thursday, April 25th, 2019 at 1:00 p.m. in Moose Jaw Funeral Home. The family would like to thank Dr. Waldner and the staff at Chez Nous for the wonderful care and compassion they gave Elma. As an expression of sympathy, donations in Elma’s name may be made to The Canadian National Institute for the Blind, 2160 Broad St, Regina, SK S4P 1Y5 or The Riverside Mission, 40 Manitoba St E, Moose Jaw, SK S6H 0A2. Arrangements are entrusted to Moose Jaw Funeral Home, 268 Mulberry Lane. Michelle Surtees, Funeral Director 306-693-4550. My deepest sympathy to the family. Keep the good memories in your hearts always. Much love to all. I was sorry to hear of your loss. My thoughts and prayers are with you. So sorry to hear of Aunt Elma’s passing. Our thoughts and prayers are with the family at this time. My wife and I want to express our sympathy to the family who lost there dear one Mrs. Edna Rudeen. To comfort all of you, we hope this scripture will help you. John 5: 28, 29. Dear Gwen, so sorry to hear about your mom. I remember all the volunteering she did at the hospital when I was working there, such a nice lady. So sorry for your loss, love always Deb Freeman. Our deepest sympathy to the family and sorry we cannot join you as our cousins funeral that day. So very sorry to hear of Aunt Elma’s passing. My thoughts and prayers are will you all at this difficult time. So very sorry for the loss of your Mom. May memories comfort you in the days ahead. I am so sorry for your loss. Thinking of you in your time of sorrow. Your mom was a very sweet and kind lady and will be sadly missed.